Recently, after having got my Rachel in, I set out for a few changes. I liked the mono volume controls very much, but decided to get a stepped attenuator for both channels. One of the things important to me was to have an exact idea where the settings for each was, at a glance. To do this, I found some indicator dials made by Ohmite. Couldn't have worked out better. I had to enlarge the center hole, so that the dials could fit over the controls, and I had to carefully drill and ream a hole in the aluminum chassis to mount these controls, but in the end, it was worth it. Also, since I was in the neighborhood, I decided also to add a selector switch. Quality was a key consideration, and I found what I was looking for. It is a Russian surplus Military switch, which is NOS. Very well made with silver contacts. Lastly, for a time in the near future, I mounted DPDT silver contact switches to employ a 60Hz filter, if I am wanting to use this amp for a HT input. This switch will only control input #3 so as not to be in the circuit for inputs 1 and 2. As things move along, I will show the underside of the wiring,etc. You're a clever man! Good work, you're making it your own. Thank you Lon, and never done it seems. In this case, for whatever reason, the new attenuaters were not doing enough, so I added an 82k resistor in series, and 4.7k to ground for each channel. Now, it seems that I would be much better off with about 10k to ground, as this combination of resistors would yield a -25db attenuation to the signal before it gets to the stepped attennuators. This gives a more middle of the road adjustment on the controls. Right now, as is I am getting good sound at nearly full volume, but the idea is to be about at a 12 o'clock or so. New binding posts came in yesterday. Changed strictly for cosmetic preference. On the bottom side, I ended up not using the screw terminals, but instead, wired in a patch of Maple Shade speaker wire that handles solder nicely. The output wires from the transformer were a hair short for my intentions, but it still turned out well with this patch in between. 'Construction Complete' may be the new title here. I had to adjust the value of the filter for the 34.3 to work with a sub amp, but now have what I need at .22uf capacitance. You can see them at the selector switch that is in between the two attenuators. On the rear of the unit, inserted resistors of 300k to match the SO(sub output). They are concealed in heatshrink and are wired from input 3 to SO. I have replaced all input wire with a Kapton sleeved, shielded silver wire. I have added damping sheets at certain points of the chassis, such as under the output transformers, and by the input tubes. Speaker terminals were replace with red copper short post types. The wire was extended from the output transformers with Mapleshade speaker wire. As mentioned earlier, the original volums controls were replaced by stepped attentuators sporting dale resistors. I think that it is time to put things back together and be happy for a long time. Since I have tried everything RATIONAL to post more than one foto, I will just do it post by post! What resistors did Steve use on the input sockets? The ones that look like little blue pills I mean. I'm not familiar with them. Also, see my guide for how to add photos. Actually, I looked at them but saw no makers mark. I have not seen them before either. I do appreciate the help with photo trouble here. I did try your advice once, but frankly, I just don't know enough computer talk to get it done. In my world, things have to be straightforward and nothing is assumed. I mean I would have just have a button to push once, not a string of things to get something to work. It's never really over for me. I am trying a tweek to the Rachel. Not because it needs it mind you, but i always wan t to know 'what if'. In this round, I am using 'Mad Scientist' 'Black Discus' Don't ask me what these are, 'cuz the MS won't divulge their product. Instead, you can only ask what it is they do. I have NOT fully tested them, but I am telling myself so far that I hear better bass and clearer treble. Am I? Time will tell. I did order a few more to experiment with. Right now, I only have the free sample that MS gives out. I really think that it would be better to try them with a head phone set up, because of the better possibility that could be heard. I will try them tomm on my SACD player which has a head phone output. More to come, and I promise some photos. 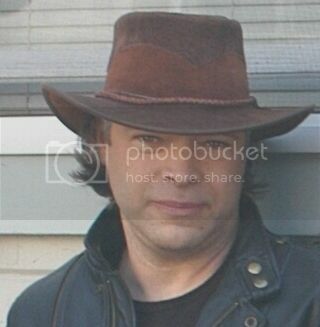 I might even try doing it the right way this time through Photobucket. Ok this would be a step too far, but back to the tweek of the week thinking. I put on the most irritating digital disc that I have SuperTramps' Breakfast in America. Yeeeow! this thing is harsh. No I have added the disc to the 34.III amp. Still not listenable, BUT a bit better than before. It's the edge of that harshness that really sends me. It is a bit less. More to follow when the big discs arrive. I received the bigger discs a few weeks ago but haven't really done any testing. I'll give them the Breakfast in America test. I just wanted to see if I can share a picture of my SE34I.32. I cannot really tell if the brass weights may a real difference in the sound. 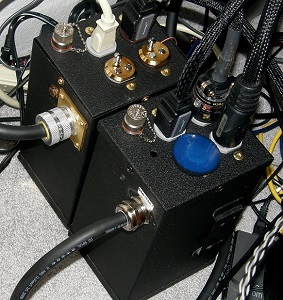 But, I think it helps couple the amp to the powerbase. Interesting buster. I use former Mapleshade brass footers as weights for my Mk III. They do make a difference for me, and I think it's in part that they assist the coupling to the Powerbase. So did you place all of the weights on at once, or did you try them, like one, then two, then three, etc. I am curious because I have heard that they can overdamp, which sounds odd to me in the first place. I did most of them at one time. Mapleshade recommends trying one at a time. I did not have time for that. I wanted to just enjoy the sound. I did not want spend what listening time I have trying to figure out if I hear a difference. I rearranged my systems, had the brass lying around, and decided to use them. I was inspired by the brass screws in your amp, and the fact that the current production has a heavier plate. Yah, I have a bit of a love affair with brass myself. I upgrade Carver C9 units. This includes a great paint job and brass screws, besides the circuit upgrades. I just think that brass looks classy, and is worth the cost. FWIW, Lee Valley sells brass discs that are intended for tracing. I have used them for anything but that. And they are relatively inexpensive. As stated, I am reporting on the effects of the 'Mad Scientist' Black Discus in my system. First of all, I haven't done that much listening since yesterday, when the shipment arrived. My initial listening has first been with the samples that were sent, and I did in fact, hear a distinct difference in the presentation of the music. This involved mostly the bass and treble. Treble being less sibilant, and 'digital', and bass being a bit more defined. So now that the purchased discs have a arrived, I can only hear a difference, whatever that might be. More specifically, the two areas touched are the bass and treble. And again, much to the same results. Having said that, I think that there is a line not to cross when it comes to devices such as these. I am already thinking that a little is good, but more, not so much. This may be premature, and I will add comments to this as it develops. I suspect that certain recordings are more in need of these effects than others. Fortunately, I finally have a system that can bear out the differences made. This is not a conclusion, but rather an update for my experience with the discs. I have used these for a short time now, and though I appreciate their effect, I am still of the opinion that one or two of these devices is adequate for my system. I do however, have a new CD player on the way from Emotiva. This may change my experience with these discs. I actually hope that it does not. If the new player sounds better with them, then it might cast a shadow on my expectations of the new player. I will keep an open mind and post my experience at a later date. You know, it will be interesting to see if the discs improve your new player. That might be because the player is more revealing? So it could mean that it's a better player? Isn't this crazy hobby maddening sometimes!? Well, I am doing things a bit backwards. I have placed the disc on the new player's power cord. I am using a Pangea 14-SE, 1/2 meter cord. What I am noticing immediately, is the background detail in music that I knew was there, but now is separated into more specific instruments, or ambience, or whatever it is that was homoginized before. Here is a little update that might be helpful to those that want stepped attenuators for the Rachel. In my experience, the stepped attens were not the best answer. Two reasons are that first the model that I use has only 21 steps. That is too coarse for fine adjustment in my opinion. Next is the fact that the model that I used seems to have some issues with balance between the two controls. I have seriously looked into this, and realize that it could be a different problem all together. Maybe the input tubes or something. I have on order a set of volume controls made by TDK. It will be good to have something with infinite adjustment. To be clear, the stepped volume controls on the amp were installed by me and not Decware. They were Ebay specials. I will know a lot more when the new controls arrive. The TDK volume controls came in today. Maybe I can find the time to install them soon. Here is a bit of truth the statement "There is no free lunch". 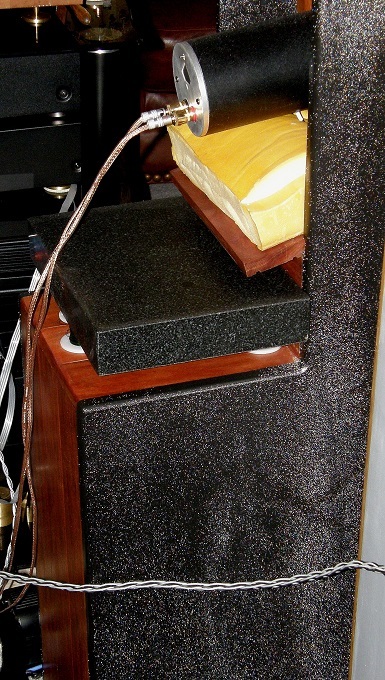 Remember a bit back, I was talking about a BSC circuit (baffle step correction) that I was using for the ZOB speakers? Well, there is, of course, an insertion loss of about 3db when using the circuit. At the moment, I am running Rachel near top speed. I didn't seem to be getting the drive that I wanted. On top of this, one set of interconnect cables was 2 meters from the CD player to the BSC circuit, and then an additional meter from the circuit to the amp. Lets just say that things weren't sounding like they did before. It didn't occur to me at the time that I was cutting off my nose to spite my face. Taking these two things out helped regain the sound that I was missing, but wait, yah, there's more. Because I can't leave anything alone, the output RCA jacks in the back of the new CD player are not reliable. What I mean is that i plug in and unplug connections far more often than the regular guy, so these connectors have loosened up quite a bit. No problem folks, I just got some new RCA jacks from Manley that are pretty beefy, so there is something else to make time for. You know damned well that the original RCA jacks are circuit board mounted, meaning more effort than Decware stuff to change something out. This Might be a conclusion,,,we'll see. Ok, I installed the TDK pots today, the comparison is that between them and the ladder style stepped attenuators, I will never look back. Something just wasn't quite right with old attenuators, and I will never know. Now these TDK pots are not only more revealing (I thought that I would NEVER be the guy to say something like that about a volume control! ), they have physical smoothness to their operation that reminds me very much of video tripods that have fluid damping. These things turn easily and even feel elegant to the action that they have. The sound is no comparison to the old ones, since the old ones even seemed to vary in resistance or something. Drove me nutty. Interestingly, I didn't have to change out the RCA jacks in my CD player because they also have a balanced output. The easy solution to this was to use quality adapters from balance to single ended right on the back of the CD player. Dodged a bullet there man. I do not try to make a better mousetrap everyday, just fix the one that I got. In this next 'episode' I find that there is some kind of small mistake that I made installing the selector switch. The switch is NOS Russian military switch with a ceramic deck, and looks to be quality to me. Anyway, I suspect that I somehow miss-wired this thing. It would seem to be an obvious job, but sometimes when connecting only the right channel, both are connected, yet when connecting only the left channel, only the left is playing. Furthermore, it only happens sometimes, and I have had enough. So I ordered a Gold Point selector switch with one deck 3 poles, and three positions. This way, when selecting from one source to another, bot signal AND grounds are switched. This isolates any possible problems originating from another input component. At $80 shipped, these things are a bit pricey, but super simple to hook up, and a great quality connection is made for each selection. I will post photos when it arrives and the installation to follow. [img][/img] So the Gold Point came in, and it turns out that I ordered a 3 Pole, 4 Position, single deck, which is good because that will give mute position. A set screw allows for the number of positions that you will use. In this case 4. So I will move it from 7 to 4. Funny, I remembered this switch to have a ceramic deck. Bet the new switch is an upgrade! I am enjoying your explorations 4K. Thanks. Here are some more impressions on Black discuses you mentioned earlier. I have had similar experience and results. My system power was already clean from many angles, and tuned to make the sound really revealing, but balanced. So a little discus went a long way here too. I too liked the sample discuss and bought more after. I got one big one and four mediums, and a couple really little ones were sent along with the order. They can all be heard, and integrating them to optimal effect was tricky for me too. It is actually ongoing, but I am glad to have them. I agree that the effect is more about opening things up, cleaning the background, and can pretty easily come off as treble and bass clarifying, but more treble here in many cases. In the right places, the more fleshed out, but also smooth treble is really good, but too much upper emphasis is still too much when it doesn't work. I am always walking the line here, ultimate micro detail without edge, and these can hurt or help in that. I had mediums on the speaker black posts, but now, auditioning some used Synergistic Research Element spk cables (with tunable active shielding that is crazily effective) the discuss were too much. Now I have the big one on the AC end of my big DIY cord feeding the P5 and a medium on the IEC end, and a medium on front of the DAC power cord (PI Audio), all relatively neutral cleaning a bit bass up. Then there is one place that is actually very neutral, smooth and warmish...I put one medium on the AC side and one on the computer side of the stock Mac Mini power cord. The overall sound was notably smoothed and clarified in all areas of the spectrum...very nice. With only one on the computer end, it helped, but had more of that treble vibe. This makes me wonder if less clean/noisier gear has more of this evener effect. It is interesting how these little noise suckers can help or hinder depending how they effect or don't effect the frequency balance. And in some places they are more noticeable, but in my system, can be heard (for better or worse) everywhere. I am coming to find though that sometimes the more neutral side is nice, and sometimes the more clean....pretty useful since they can put them about anywhere, fine-tuning to taste. Will, I appreciate your comments, and have to say that I have many of the same experiences with these discs. Lately, I have used a large cupcake size on a switching power supply for a D amp that I just got in. Even though it helped, these amps all seem to have a sonic signature this side of harsh for my ears. I am hoping that there is a break in period for these amps, but so far that has not been my experience. With the AN speakers, this amp is a double whammy. The speakers are a little sharp sounding unless I employ a Gizmo, or face them straight forward with very little toe in. Nothing here that a disc will straighten out. What value Jupiter caps are those? Without looking, I seem to recall that they are either.1 or 1.0 I will find the photo and see if there is a better angle. A closer look reveals a flat stacked, copper foil, .10uf with no voltage rating printed. It may be on the opposite side though. Thanks! Gotta find a home for these .47uF Copper Foil Jupiters now. Whew! I'm thinking of installing one way security screws into the wood base of my Rachael. Maybe you already caught on, but I can't leave stuff alone! It's kinda not my fault guys. You see, I got these Genelex 6922 tubes to try out and I like them. Ummm, but they don't have quite the needed umph of the original 6N1P. To top it all off, I had put in line level attenuation after the volume control so that I could run higher gain tubes, and still not over drive Rachael. It was always pretty close to running her wide open, so I thought that reducing from 20 db to 10 might fill the bill. Apparently not, and in the end, there is no attenuation in the input. Of course, this is most desirable. Interestingly, Rachael cannot be driven to distorted levels with these tubes due to their lower gain. Let me finish this thought by saying I am running about 3-4 o'clock position with more than sufficient output. 'Nuff said. Yes, this is still the Rachel experiment, but with respect to what goes into it and what comes out of it. First foto is of 'The Push Brothers'. Two Richard Gray 400s chokes that are feeding the isolation tranformer input, and the other one feeding the secondary of the isolation transformer. Then the next foto is about adding weight to the ZOB. But where to put the weight? I decided to add the 30 pound granite blocks right above the port hole. So far so good. Never stop playing. That's right. Yesterday, I wondered what the sound would be like hooking all 4 of my speakers to the amp(yes, 2 speaker per channel). Surprisingly, it sounded better than I thought, although I wouldn't call it a keeper. The volume was very good, and it makes me wonder what if I used my second set of single driver speakers as subs just to hear what that sounds like. More later, less sooner. Re: MISSION CONTROL TO U.F.O. I warned you all. Rachel came back from surgery and wanted to play as soon as she got home. I thought perhaps that I should kinda be easy about it all, and I was for 15 minutes. Then that is when things changed. Hell, if I can play PF The Wall at lower volumes, then I can go for Donald Fagan's Nightfly album at a higher volume and everything will be fine. Well, I got more than I bargained for. I have heard this album in the past, but honestly, I really figured that my hearing had diminished to the point that cymbals just weren't going to ever be the same. Wrong. I knew there was a light high hat splay on 'Ruby' but this was the first time that I have heard it in years. Moreover, there is the fading of many notes that I just wasn't getting. Figured That was for the same reason. Indeed, this seems to be a hearing aid for me. I wasn't as concerned with bass, but it is also increased, though not as much as the rest of what I have described here. I know that things are bound to change, so this is more of a preface to what lays in wait. In case you don't read it somewhere else, here is an update for Rachel and the room remake. I finally changed out my carpet with wood flooring. Not the 3/4" stuff mind you. This is an old house and deserves 'good enough' and not much more. I laid a sub floor and attached it very securely to the original wood flooring, which was impossible to save. Point here is that this new acoustical arrangement is quite different than what was there before. Not expectedly, I am impressed by the sound, and details aren't sucked as much as they apparently were before. Mostly lower midrange details are the ones that capture my attention. So between carpet and wood flooring, I would go with the wood flooring at least when it comes to my room and furniture. As an aside, the upgrade of the transformers and bias adjustment has been wonderful. More bass than I could imagine, and detail in spades. Now, on to tube rolling with the 6922 input tubes. Right now, I am using Bugle boys and they are impressive, but there are a few more in line such as the Genelex, and Telefunken. More later, less sooner. I hope I don't risk going way over the edge with the complexity of the modification I think would be a good idea for me and my Rachael. -hang on!- I've realized more than once that I've left my amp on all night. Partly, maybe, because I most often don't stop listening until I get too tired to stay up any longer. But I also think it's because I don't have any "helper" to remind me if it is still on when I quit. So, would a lit on/off switch be okay? I'm talking about negatively affecting what I'm listening to. .. If it's an okay thing to do, I think I'd have to send the amp back for "service" rather than do it myself - so I don't void the warranty, is that correct? One more question: Would it be a pretty simple thing to replace the meters with meters that are lit? On the meter question I would say that's an easy "no". The meters would need some voltage tapped off the amp internals for the lighting. And based on the type bulb it could introduce noise, both conducted and radiated. And I would surmise that the meter lights would be no more noticeable than the glow from the tubes themselves. Thanks for your answer. I wasn't really sure about what lit meters would look like, only that I thought they might draw a little more attention to themselves. Not all that important, so a "no" to that one isn't all that hard to take.  Thanks! No comparison. That's just unfortunate. I tried a Red Wine 15 'Signature' SS amp with my ZOB speakers. WHY? you ask. Well, then you just don't know me like I do....I figured it might be my 'summer amp.' Ha, yah, says I, it doesn't produce as much heat in the listening room as Rachel (bless her heart). So I tries it, I do. For awhile too. Then I switch back, and like I says, no comparison. Dam, that's too bad. You just can't get away with anything. I would right ahead say the opposite if it were true, but this amp with the mods is really hard to walk away from....not that I am looking for an excuse, but I thought the ZOB speakers would compensate for any shortcomings that might be present in the Red Wine amp. Lol, life & it's struggles, huh. This is more of a question than an update about Rachel. I am using her as a headphone amp at times, and in general it is great. Now with speakers, there is a slight hum that just doesn't matter to me. Then there are headphones,. I can make the hum less with a voltage divider, and that is OK, but what can I look into for getting rid of it altogether? I have changed out the rectifier tube. I am using 274B. maybe a different tube will help? That would be a nice easy way to get it done. Otherwise, I am looking at the underside of the amp, and see nothing that is out of order. Maybe new power supply capacitors? Dunno.